If you want something you have to go for it! 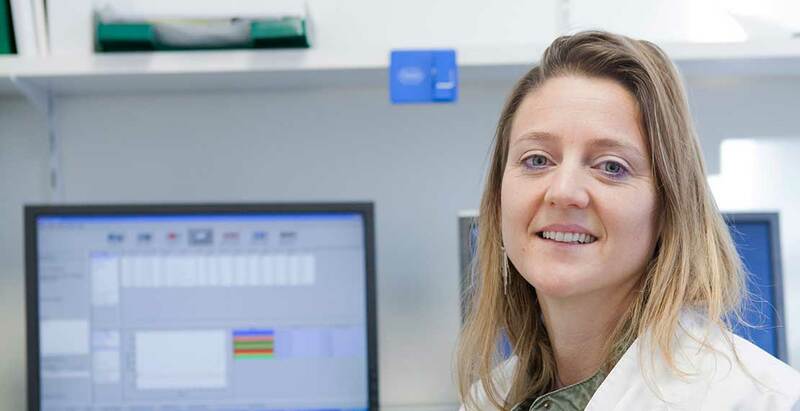 Molecular biologist Lieselotte Cnops has developed many diagnostics tests for ITM over the last 10 years. Her latest being a series of innovative sample-toresults tests that provide analysis on a multitude of diseases in one go. P3 gets to know Lieselotte’s diligent drive for success. Lieselotte Cnops, an up-and-coming Flemish researcher at the Department of Clinical Sciences, is a person who has worked very hard to achieve what she has achieved. Currently, this is a series of ingenious molecular diagnostic tests– including a number of fully automated sample-to-results tests in cassette form –for a wide range of tropical viral diseases. “I have six brothers. Growing up, everything was a competition – when you’re riding your bike together it’s about peddling as fast as you can to beat the others; at the seaside it was about who’s the first to reach the water...They taught me to be tough.” This tenacity shines through in her past studies, throughout her career at ITM and in her family life, where she is the proud mother of two boys. Thinking back to her studies, although good at sciences, Lieselotte remembers the initial years of rote learning during her biology studies at university as a challenge. “But with my Masters I found the interpretation and understanding part better,” she recalls. And she didn’t stop there; in 2006 she completed her PhD from the University of Leuven and continued on with postdoctoral research from 2006 to 2007. In 2008 she started at ITM. As a molecular biologist she has worked over the years on developing diagnostic tests for over 20 parasites, viruses, bacteria, and fungi. In December 2014 she was the first person at ITM to be granted a postdoctoral innovation mandate given by the Flemish government’s then Institute for Innovation through Science and Technology (then IWT, now VLAIO). The mandate seeks to connect research with industry in the region. In Lieselotte’s case it was with Biocartis, a Flemish company specialising in molecular diagnostics. The mandate is now complete and Lieselotte, together with her scientifi collaborator Birgit De Smet, have successfully developed, under the supervision of virologist Kevin Ariën of the Department of Biomedical Sciences, a fully automated sample-to-result molecular diagnostic prototype test for the simultaneous detection and identification of a broad variety of medically important viruses transmitted by arthropod vectors (such as mosquitoes). Just as for her studies, however, she didn’t stop there. During the Ebola outbreak she also worked with her team and Biocartis to fast-track a test cassette for the detection of the Ebola virus and has also moved on to develop this cassette to include a number of other hemorraghic fevers such as yellow fever. ITM is currently field testing these cassettes in low-resource settings. Lieselotte’s dream is to make them available worldwide, especially in endemic or epidemic regions where they are most needed. The recent outbreaks of Ebola in West-Africa and of the Zika virus in Latin-America, clearly demonstrate the need and added value of such molecular tests that target multiple viruses in one go. To turn this dream into a reality, once ITM has completed the field evaluation of the tests, Lieselotte and a multidisciplinary team will look into ways of making the diff erent cassettes available on the market.